Finding a job is a challenging task. Nowadays, the competition is so high that even a qualified candidate with a perfect resume need to struggle a lot to find his place in the industry. The extremely talented people are unable to find any vacancy and end up with frustration. This situation of not having a job is called unemployment. But this is not the end of the road. Staying positive at work within this struggle period is something that all people do not carry, but you need to learn to survive happily. Being unemployed and depressed is very much common in one’s career. But you always need to stay optimistic by keeping a positive attitude. A few best practices will help you develop positivity during the job search period and help you develop your skills. Tips for Staying Positive When Seeking for a Job? The following mentioned are few tips on how to stay motivated and ways to stay positive in life. Shift your focus from job search to something else that you are interested in. Only thinking about a job will lead you to unemployment depression, so you need to focus on multiple tasks that you’re passionate about. Spare sometime watching a motivating movie or you can get involved in some extracurricular activities to enhance your physical and mental ability. You can also hang out with your friends to get cheered up. The more you focus on additional stuffs, the much better you will feel. Do not pause your job search routine. This will make you lose interest. Create a daily routine and spare sometime in searching jobs. Take a short coffee break or lunch break in between. This will help you stay focused, keep your spirits high and also motivated. Concluding the search, out of frustration will make you more depressed and anxious. Since the chances of negativity are more during a job search, you should start listing down the things that motivate you the most. You can start off with your family and friends to understand how grateful you are to have such people around you. You should be thankful for all the good things that you have. This will uplift your confidence and motivation and you’ll recognize that you’re not alone. Enjoy the smallest victories like getting a phone interview from the employer or getting an email response. Be happy when you receive positive comments or befriend with a professional executive or may be a cute girl. Celebrating the smallest wins refreshes your brain and helps you focus. Be happy over the minor things that make life beautiful. Do not pretend to be alone when you are jobless. There are certain people around you to whom you mean a lot in their lives. Your friends and family are the people who’ll never let you be alone and will be always by your side. So stay around such beautiful people who support you and make you keep strong and motivated all the time. Be prompt in responding to an email or making a phone call. When you find a job relevant to you, do not wait to apply, instead apply immediately. Employers like people who are quick and active. Don’t keep the negative feeling that the others didn’t respond to you. It doesn’t matter because keeping in touch with the job search will lead you to a bigger opportunity someday. Utilize any good opportunity to earn some cash. You can sell your old and unused gadgets or do some online works. If you got some talent then utilize it in exchange of money. You can offer services at the cheapest rates. That will help you find some leads who need services at the low cost. Staying engaged will distract you from the negative stages and help you stay consistent with the job search. Staying idle and inactive is likely to increase the state of negativity inside you. When you are not involved in any task, the devil arises inside you which compel you to fall into job search depression. So whatever task it may be, whether you like doing it or not, stay occupied with it. If your dad asks you to bring home the LPG cylinder, then do it instead of lounging around. Instead, this will help your father reduce his burden and you’ll feel proud of helping him. There’s an opportunity in everything you do. However tired you are of submitting resumes and typing cover letters, you’ll never know when an opportunity is going to knock on the door. Not all employers will have the same idea about you. There is someone who will understand your capabilities and give you an opportunity to work with him. Don’t get distracted easily with negative statements. There might be some people who would discourage you with low rated comments, but you need to hold your confidence as strong as you can. Negative comments are likely to brainwash you with pessimistic views. So you need to encourage yourself at that moment and believe that you can do it. Talk to people who have always supported you and had been by your side. Take their advices regarding your future and believe in their words. Getting surrounded by positive people will encourage you even more and develop your self-confidence. If you don’t have any such people around you then contact a counselor, spiritual advisor or a psychologist. They will give you some positive tips to stay motivated. Don’t let your confidence move away. Confidence is your inner support and the root cause of staying motivated. When an employer will interview you, he’ll first point out whether you are a confident person or not. So letting this feeling go away will destroy your inner spirits. Without believing in yourself you won’t be able to believe in anything else and do anything. Trust yourself and believe in the fact that you can do it. A goal does not happen in a single kick but it occurs once after getting a number of opportunities. So don’t lose heart if you fail a number of times. Keep trying and believe that it will happen. Instead of staying idle and cursing your destiny, focus on your skills and talents. Try to improve them with more and more practices. Your talents are the key to a greater opportunity, so preserve them. Even qualification is not given so much preference as it does to talent. Learn from your past mistakes and recover them. For instance, if you have not performed well in your last interview then find out where you went wrong and try to improve it. Or if you made any mistake in the last resume that you submitted and correct it. Ask the employer what was wrong and make it accurate the next time you apply. When you receive any negative comments from the employer, make it a weapon to improve your quality. Negative comments are more likely to motivate you and make you stronger from inside. Because it grows a sense of competitiveness and urge you strive for a longer time. Ask yourself what you really want to do in life, what are your career goals, what motivates you, etc. There are so many questions you want to answer; you need to sit sometime alone and find them. Think about what you have achieved till date and appreciate them. This will encourage you even more and help you move forward. There are many inspirational books you’ll find in the marketplace. Read stories of the people who have struggled hard in their lives and how they accomplished their goals. Stories of successful people will motivate you even more and you can learn the tactics to improve yourself. Read about the mistakes they made and how they recovered it next time. As you have learned the points to stay positive during a job search, you should not read these tips for a single time. Print this article and read it again and again whenever you feel demotivated. It will boost up your inner spirits and help you keep positive and encouraged. Keep it in your wallet or paste it on your wall to read frequently. 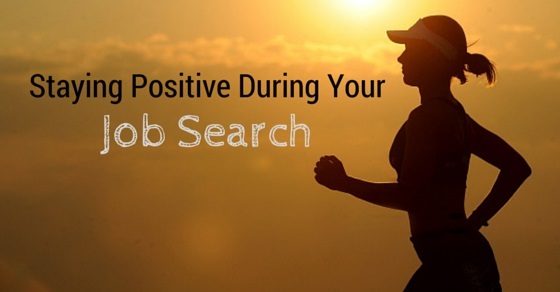 Since searching a job is a hectic stage you need to remain positive and consistent for a certain period. Try to avoid the negative thoughts as much as you can by getting involved in other projects. This will distract you from getting pessimistic and help you develop your skills. Communicate with more and more positive and experienced people to learn from their lives and their mistakes. Read stories of great and accomplished people who struggled a lot in their lives to achieve their goals. This will help you motivate yourself and help you keep calm and stay positive all through the job search period.